If you know me, you know I love cheese. If you don’t know me… hi my name is Leanne and I LOVE cheese. I love cheese in all its glorious forms but am I right in saying nothing beats melted cheese. So needless to say when I discovered Meltmongers a café dedicated to the melted cheese beauty that is a cheese toastie, I knew I needed to go. How it has taken me this long to finally get around to going to Meltmongers I will never be able to understand or comprehend. But finally, I have been and I’m already trying to plan my next trip. Now I know what you're thinking, the entire menu can't just be toasties and you're right it's not. Meltmongers also do all day breakfast burritos and a variety of burgers. The cheese is the centre of attention on this menu (my dream menu) from breakfast sandwiches drenched in cheddar to cheese sauce on all the sides. The melts themselves (I keep calling them toasties I hope the melts don't take offence) come with a variety of fillings from your classic cheddar to tuna and cheese to brie and caramelised onions. There's something for everyone... providing you like cheese. I had the 'mac and cheese' cheese toastie, which isn't actually on their menu as it used to be a special, but if you ask kindly they'll usually make it for you. And boy is it worth the absolute carb overload. Macaroni and cheese smothered between two pieces of soft on the inside but crunchy on the outside thick pieces of toasted bread then sprinkled with parmesan to finish. The first thing we actually said was 'even the bread is good'... I'm drooling just thinking about it. We also had the sweet potato fries with the cheese dip which was great – but try to eat these first if the dip goes cold it turns back into solid cheese! 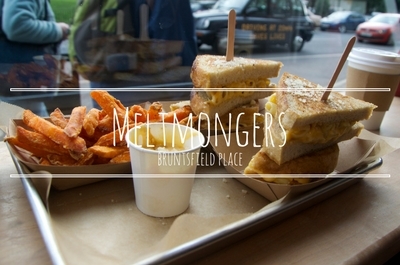 I'm definitely keen to go back to Meltmongers, I have my eye on the chilli jam toastie next. I'm also dying to try the sweet melts (which I actually forgot about when I was there and I'm not happy about it) because they have a Nutella, banana and marshmallow melt. Yes you heard me right. If you're a fan of cheese and cheese toasties (melts sorry they're called melts) you need to get yourself down to Meltmongers – it is what all your melted cheese dreams are made of... and more. Find out more about Meltmongers on their facebook. Though she be but little, she has a big appetite.